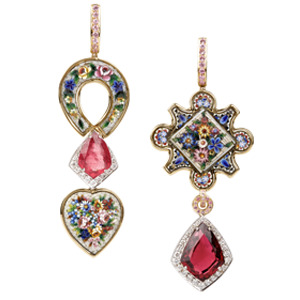 The Nourbel & Le Cavelier Nada Roma collection incorporates historic colourful and intricate micro-mosaics dating from 1850 to 1960 into fresh, modern jewels, with a playful twist. The collection is designed by Nada Le Cavelier and each piece is unique and one of a kind. Micro-mosaics were originally made in Venice, Florence and Rome and were intended as souvenirs for wealthy tourists on grand tours of Italy. No longer in production, they were made from pieces of glass paste, some the size of a pin's head, intricately assembled to form miniature bouquets, birds, frescoes and monuments. The earlier they were made, the tinier the tesseraes - these were the meticulously carved shapes of glass paste, sometimes round, marquise or just the right shape for each design. The allure of these contemporary works of art lovingly designed by Nada Le Cavelier is their inherent rarity along with the creative ways in which these old mosaics have been re-set. The new jewel might take the form of a graceful butterfly, a delicate dragonfly, a friendly fish or Nada's beautiful signature assymetric earrings, but all the while it respects the shape of the original micro-mosaic.